Derrick Rose's distinctive floater is one of the NBA's most recognizable shots. Reaching the NBA demands rigorous practice of time-honored fundamentals, but the peculiar styles of individual players are what make it a rich, exciting league. No one will ever throw that looping shiver of a crossover quite like Allen Iverson; the move was his fingerprint. These quirky, signature moves are everywhere in the NBA and are the texture of the league. It’s not quite a floater and not quite a runner, but Rose’s phenomenally accurate one-handed push shot is one of the masterful shots in the game. Like no player before him, Rose has the ability to go from full speed to a two-foot stop, rise up (and often over much larger players) then coolly flick the ball either straight in or off the backboard with sublime touch. As Ethan Sherwood Strauss explains, "Howard employs a tactic that is childish and brilliant, all at once. When you were a kid, did you ever tap a friend on the right shoulder, only to swoop in from the left? This was an effective means of taking a toy back, because your victim reflexively whips around to the wrong side and stares at air. Well, that's Dwight Howard's offensive rebounding move. When someone tries to box Dwight out, he taps them on right side, then crashes to the left (or vice versa)." A cousin of the far more prevalent step-back, Paul loves to set up his midrange jumper, usually off a ball screen, by faking to the middle of the court with his killer in-and-out dribble then bouncing sideways to the space just outside the elbow. People associate Rondo with his fake behind-the-back pass, but that one's been around for a while. What I haven't seen guards his size do is use pass fakes from a standstill as well as he does. Opponents play off Rondo to better obscure passing angles, especially after he picks up his dribble. To compensate, Rondo, like a quarterback sitting in the pocket, uses violent pass fakes to shift the defense and open avenues to his teammates. Jefferson, one of the most technical post players in the game, does something that a lot of players with bad fundamentals do: shoot a jump hook without first pivoting to get sideways with the hoop. When other people do it, it looks wild and desperate. But Jefferson has mastered the art of starting with his back to the basket, then simultaneously jumping and turning to drop in a soft hook shot. For being a relative shrimp who can't really jump, Parker sure is a killer finisher around the rim. His great footwork and dexterous finishing helps, but he also has a move that is probably an offensive foul yet may never be called as long as he plays. When his defender is able to get in front of him on a drive, Parker brings the ball to his waist and pushes his defender with the ball. The defender is sent backward, creating space for a finish, and often Parker gets the foul call to boot. This move became a major topic of conversation in the playoffs, when Harden used it to earn free throw after free throw. Typically, players are taught to conceal the ball on drives to the basket in order to protect against the defense's prying hands. But Harden holds the ball way out, often past his defender as he makes his move, exposing the ball but also plenty of arm. More often than not, the defender swipes down and hits his arm, and Harden, expecting the contact, is exceedingly adept at finishing with a score. Legend has it that Scola's first words were "juego del viejo hombre." His old-man game has tortured defenders since he entered the league, and one of his favorite weapons is the underhand scoop. Post defenders are taught to put their hands straight up to contest a shot. But that doesn’t do much with Scola, who loves to raise a defender with a fake then reach past his defender and flip in a low scoop shot. No jumping required. Steve Nash shoots a 15-foot runner about as well as it can be done, but that's not what gets him on this list. What's so uncanny about Nash's move is that he can shoot it by jumping off his right foot, which is a truly awkward motion for a right-handed player. 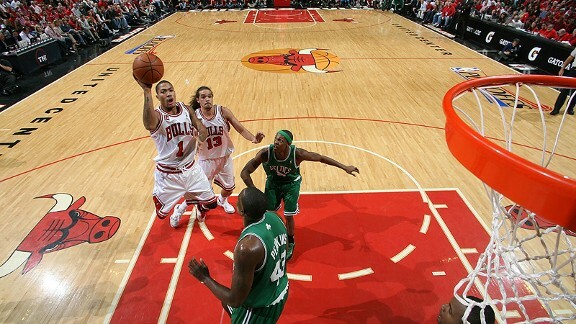 Pierce isn't particularly quick, so how is he always able to get space for that jumper? Part of it is that he sometimes uses unorthodox footwork in his pull-up. The natural motion for a right-handed player moving to his right is to stride-stop, plant the (outside) left foot, plant the right (inside) foot and fire. But Pierce uses his outside right foot to stop his momentum, then uses his left foot and left shoulder to nudge his defender and create space. Pierce ends up firing the shot a half-beat earlier than his defender expects and uses a little muscle in the process.